HV Plast has a high degree of automation, resulting in low staff-cost. With high turnover and low fixed costs, we are a very competitive player on the market. HV Plast has had a very good sales development in recent years. Production-facilities and machines has continuously been upgraded to meet international requirements. We focus on efficiency, and the equipment ensure high productivity. Our machine ​​park consists of 48 injection molding machines with robots, from 25 tons to 1300 tons. 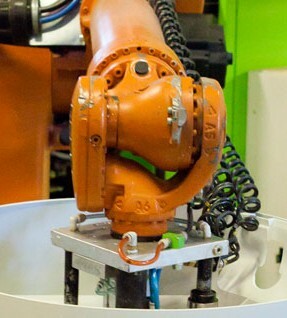 Save time and costs HV Plast have robots on all machines, and has come a long way in terms of fully automated production. We produce 24 hours a day year round and focus on production with lowest possible cost. The automation of production ensure better working condition. It also brings benefits for you as a customer, it is both cost effective and time saving. We focus on keeping a low price level, right quality and fast delivery. Production Range and machines has lately been upgraded to meet international requirements. In recent years we got new large customers like Kongsberg Automotive, OSO Hotwater AS, Nordan AS etc. Through our efficient operation and competitive conditions HV Plast can be an attractive option for many customers and we have a clear strategy for continued growth in the years to come.